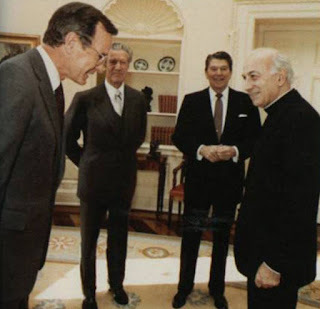 Whispers in the Loggia: On 41's Passing, Recalling "Bush's Bishop"
Given the tide of mourning over Friday's death at 94 of George H.W. Bush, when it comes to this beat, one piece of the 41st President's legacy bears particular note, all the more as its impact extends into the present. At its core, next year marks the 35th anniversary of the establishment of full relations between the Holy See and the US. Though the bilateral ties are easily taken for granted today, if anything – fraught as it was with anti-Catholic prejudice and conspiracy theories – the path to Washington's diplomatic recognition of the Pope took almost a century to accomplish, and were it not for Bush, odds are the wait would've stretched even longer. In a way, that owed itself to a quirk of history... well, one among others. In 1974, six years before the Texas bureaucrat's election as Ronald Reagan's Vice President, the Federal government finally got around to giving its #2 an official residence: a house on the grounds of the Naval Observatory, located along the Massachusetts Avenue heart of "Embassy Row." Yet as it happened, the move would be an unwitting boon for the Vatican – since 1939, the Holy See's base of operations in the States, then known as the Apostolic Delegation, was located right across the street. At the time, the state of affairs meant that, in the absence of formal relations, the Apostolic Delegates – in place since 1893 – were the Pope's emissary solely to the US church, with no status before the government. 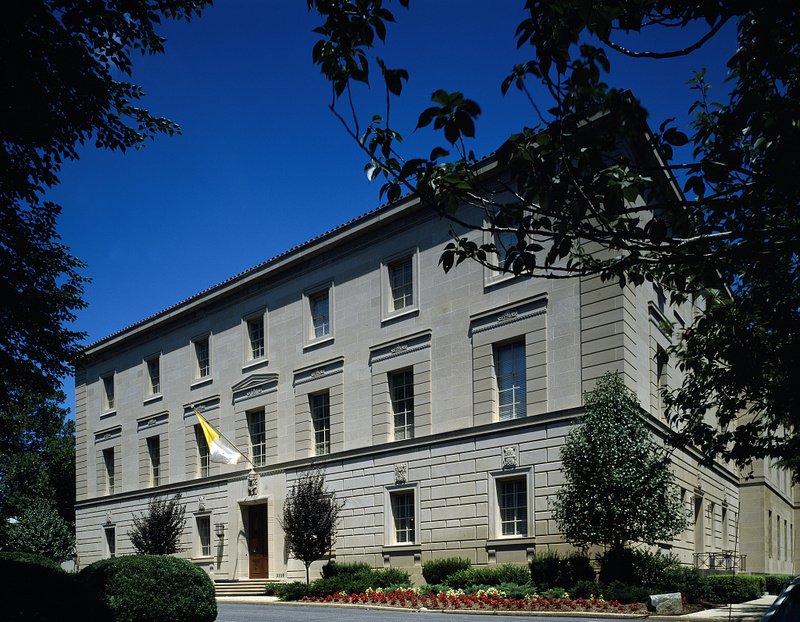 (On the flip-side, after President Franklin D. Roosevelt proved unable to establish full relations due to lingering suspicion toward the church from Protestant senators, the late 1930s saw FDR institute a "personal representative" of the President to the Holy See, who served as an ambassador in all but name.) Yet by the time the Bushes arrived at the VP's house, their presence joined other sea-changes on the global front in giving the century-old impasse the momentum to shift. Despite the absence of full diplomatic ties, the early 1980s already saw a tightening of American and Vatican interests. In 1978, the election of John Paul II brought to Peter's Chair a figure whose deep personal experience with the States was without precedent for a Pope, an attribute born from multiple extended visits, and just as much through a network of Polish-American contacts who quietly funneled sizable aid for their homeland's suffering church and its resistance to the Communist regime in large part through the cardinal-archbishop of Krakow. In that light, per custom at the change of pontificates, the new Pope made the Washington posting a key early target of his geopolitical strategy, naming Archbishop Pio Laghi – whose prior assignments in the Holy Land and Argentina made him a heavyweight of the Vatican's foreign service – as his Delegate to the US within days of Reagan's election. And while the courtly Italian, whose patrician bearing masked his simple upbringing, would openly execute one revolution – stacking the American hierarchy with prelates who reflected a bolstered sense of Catholic identity – a second, stealth effort would fuse Pope and President in a multi-front campaign to dismantle the Iron Curtain, a push in which Reagan's deputy would play a linchpin role long before Bush's own administration presided over its formal demise. Having remained in the post through his friend's election to the Presidency and the fall of the Berlin Wall – while internally overseeing a sweeping recast of the Stateside bench in John Paul's image and likeness – Laghi was recalled to Rome in 1990 as prefect of the Congregation for Catholic Education and made a cardinal months later. Since his departure, no occupant of the Washington posting has approached his length of tenure in it. Almost always seen as the most influential Vatican legate the US has known in its era as a hegemonic superpower, Laghi's decade in the capital still endures as a point of reference, and the man himself was discreetly sought out for high-level American efforts or advice in Rome practically until his own passing in 2009. 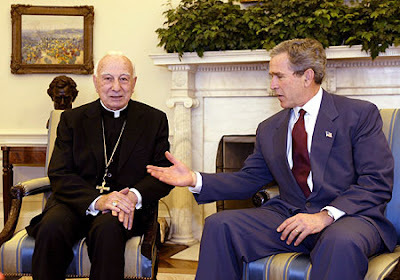 In the best-known of those moments, as the White House push for a second war in Iraq gathered steam in early 2003, the former Pro-Nuncio was tapped by John Paul as his personal emissary to President George W. Bush, tasked with returning to Washington to convey the Pope's intense opposition to the campaign. While the choice of messenger indicated the most concerted engagement for peace that the Vatican could make, of course, the mission (carried out during 40-minute Oval Office talks with "43") proved futile. Upon departing the capital, the cardinal "realized that the Bush administration was very naïve about the consequences of war" – a sense that would only be revealed after his death. Though all but a handful of Laghi's appointees are long gone from office, several of the young local aides from his US posting were subsequently named to the bench and remain atop the American hierarchy: a group led by the sitting cardinal-archbishops of New York and Chicago, two of the nation's three largest dioceses. Of all the "Laghini," however, the DC aide invariably described as the most beloved was Msgr Bernie Yarrish, a son of Scranton whose own elevation was precluded by a two-decade battle with multiple sclerosis. At 67, Yarrish died of the disease in June, with Tim Dolan – who brought his onetime Nunciature-mate to Rome as his Vice-Rector at the North American College (Yarrish's final major assignment) – leading the sendoff at the fallen cleric's boyhood parish. Laghi's fifth successor at 3339 Massachusetts, the current Nuncio to the US, Archbishop Christophe Pierre, will be the Holy See's representative at Wednesday's state funeral for Bush in Washington National Cathedral – sitting not with the delegations of ecumenical clergy, but the diplomatic corps. In keeping with the procedures on the death of a former President, President Trump has declared Wednesday as a national day of mourning; among other entities, the Federal government will be closed in tribute, as will the financial markets, and mail delivery will be suspended. On another protocol note, church institutions with flagpoles are advised that the US flag is to be flown at half-staff until sunset on New Year's Eve – 30 days from 41's passing. However, where applicable, the custom does not extend to the Vatican flag – as it represents a sovereign entity, the Holy See's banner is lowered solely upon the death of the Roman pontiff through the subsequent Novemdiales, the nine-day mourning period that precedes a Conclave.